Steamy Fantasy: What is your neighbour doing? What is your neighbour doing? Another great photo from Bratislava. I'm not referring to my photographic skill. I mean it's such an interesting image. 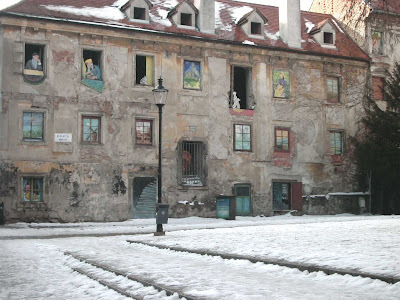 For an old run down building, by decorating it with some intriguing people and arts, you can attract tourists to stand and watch for hours. I wouldn't mind that if it wasn't that cold. So instead, I made a snapshot to save this forever. Story inspiration? A neighbourhood of eccentricity and crazy love?